By popular demand we now have Volume 1 back in stock. This special short-run reprint was made exclusively for us and we are so happy to make this available to you. 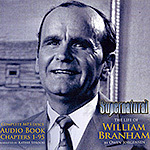 From birth, William Branham was set apart from the ordinary. Though raised in poverty, and isolated through rejection, even during childhood, he was immersed in spiritual experiences. To others, he seemed like a nervous child. At just 14, a shotgun accident set him near death in a pool of blood. While hospitalized, he experienced a terrifying vision of hell - personally falling constantly deeper into a region of lost and drifting souls. On the verge of death, he cried out to God and was given a second chance - a chance which he later almost failed to grasp. 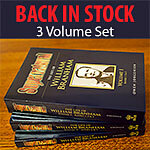 As a young pastor, William Branham was severely tried and tested. He lost his wife and daughter to tuberculosis, and ministers told him that his visions came from the devil. Desperately seeking to understand his peculiar experiences, he was visited by an angel and given a commission from God to take a gift of Divine healing to the peoples of the world. Would people believe an angel had met with him? He was given two supernatural signs to vindicate his calling, and many believed! Within two months of William Branham's commission, the extraordinary sign in his hand that identified disease had gained national attention. People by the thousands flocked to his meetings, where he preached salvation and healing in the Name of the Lord Jesus Christ. Miracles abounded. Even so, some people still questioned whether an angel had really met this humble man. Then the second sign began, with supernatural manifestation, and many more people came to believe!